On a hot August afternoon at the Army Navy CC in Fairfax, VA, Richard Mandell is doing what golf architects love to d0; he is actually designing something. After all the planning, the meetings, the red tape, the renderings, and the rough shaping, he is out there in the sun with a marking gun, spraying paint on the dirt. Dressed in shorts, striped polo, and well-worn, ankle-high, leather boots, he’s moving with energy and confidence, laying down a dashed orange line for the shaper to work with. “That’s because I can see it now,” Mandell says. “Qui has finally given me some room to work in.” Qui is Qui Fabian, the project manager of the Wadsworth Construction crew that is doing the work on the course. He takes the comment as intended, a piece of good-natured kidding. There’s obviously mutual rapport on this project, and a good vibe. All three men — Mandell, Giannini, and Qui — have been been working hard to keep the project on schedule and on budget, and they all have reasons to want it to be a success, but Mandell might want it the most. Week after week, he has been making the 6-hour drive from his home in Pinehurst, NC, to put in time on the site, giving his full attention to each and every detail. At the age of 42, he’s had other projects, but the renovation of the ANCC is the largest design commission of his career. With 54 holes of golf, two sites, and over 2220 resident members, the ANCC is the biggest, busiest private golf operation in the National Capital area, and Mandell has gone the extra mile — the extra thousands of miles — to make this renovation a break-through project. He almost didn’t get the job. In fact, he almost missed the opportunity to put in a bid for it. If ANCC Director of Golf Greg Scott hadn’t given him a last-minute interview, he wouldn’t even have been in the running. 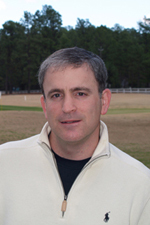 As it turned out, Mandell prepared a renovation master plan for the two courses and won over the selection committee with a presentation that he calls “the performance of my life.” Even so, the committee reluctantly decided to go with a “name” architect — then found that his completed master plan was unacceptable. They brought in Mandell to undertake the multi-million dollar renovation that is now in its fifth year. Even though the project is not yet completed, it has already been awarded First Place in the 2011 Renovation Of The Year category in the Golf Course Industry magazine’s 7th annual Builder Excellence Awards. When he describes the interview process, Mandell doesn’t show any resentment or frustration at having been passed over for a better-known designer. In fact, he notes that one of the reservations the selection committee had about him was that his fees were too low — and he laughs when says, “That was easy to fix.” After almost 20 years in the business, most of it spent chasing commissions to little avail, Mandell is accustomed to setbacks. He just doesn’t let them faze him. This last year has been the most productive of his career. He now has a business development manager, Gary Strohl, and he has become more selective about sending out proposals, partly because he’s so busy that he just doesn’t have time to write them with care. This year he has sent out 14 proposals, 11 of which were in response to potential clients who contacted him. That’s a far cry from the days when he made as many 50 calls a day without getting a single call in return. When Mandell thinks about the people who are going to play the course, he doesn’t think first of Tour players. He’s more concerned with making a course that works for everyone, an approach that is in character for a man who has made it part of his mission to make the game more accessible; he hosts a regular radio show on AM radio and he started an annual Symposium on Affordable Golf. Mandell grew up in Westchester County, just around the corner from Winged Foot, though he is quick to add that his father wasn’t a member. He played a lot of his golf as a caddie, winning the Caddie Championship twice at the Bedford Golf and Tennis Club. This is an old Devereux Emmet design, and Mandell didn’t even get to bid on the project when the club decided to renovate. He doesn’t let himself sound disappointed, though it’s clear that he loved the classic layout and would have welcomed the chance to work on it. After attending the University of Georgia, where he studied landscape design, Mandell spent a few years working for Dan Maples and Denis Griffiths, doing the usual entry-level grunt work for aspiring your architects. He struck out on his own when he founded Whole In One Design Group, partnering with three engineers. The idea was that Mandell would do golf design while the engineers would bring their expertise to other aspects of the projects. It never worked as envisioned, and he ended up buying out his three partners. All the while, though, he kept hammering away, taking any and all commissions he was able to get, no matter how small. His exposure to the classic courses in New York had made him familiar with traditional, lay-of-the-land design, and he knew that, given the chance, that was the style of design he’d like to do. He never got the chance. He found work doing the small-scale projects that other architects might have disdained, such as building small practice ranges or performing triage on courses that were in dire straits. There wasn’t much room to express any kind of style, but Mandell thought of his work as following the practice of the old-timers whom he admires. “They were all practical,” he says. “They didn’t have the money or equipment to do whatever they wanted. They had to go with what the land offered, and the work had to be inherently sustainable — there weren’t big budgets for irrigation and maintenance in those days. It all had to work.” As he was trying to get a foothold in the business, he kept studying classic courses and classic designers, and in 2007, he published a meticulously researched book called Pinehurst — Home of American Golf (The Evolution of a Legend). This ANCC project has given him a chance to flex his design muscles; the Arlington course dates back to the Golden Age, and Mandell was able to put in place the ragged-edge bunkering and strategic challenges that were consistent with traditional design. Here in Fairfax, however, he is facing a different kind of design challenge, one that requires him to subordinate his own sensibility to the requirements of the job. This course was originally laid out by Robert Trent Jones, and the bunkers Mandell is marking are all curves and arcs — the RTJ style. One clear desire of the ANCC membership was to keep the two courses distinct from each other and true to their original character. At a bunker that has has already been “shelled out,” Mandell pauses to point out how the edges have been cut so that they aren’t perfectly vertical; they actually overhang the bunker. This is his preferred technique for bunker construction since it enables the maintenance crews to push the sand a little higher, making everything a little more stable. Gianinni, too, has a way of laying sod at the top of the bunkers that adds to the stabilization. He “bullnoses” the sod, letting it curl over the cut edge and down into the sand. In the course of the afternoon, moving from hole to hole, the three men banter back and forth, touching on all manner of design details: the visibility of the bunkers on approach shots, the placement of irrigation heads, the contours in bunker floors needed to insure good drainage, the artificiality of some of the berms that were originally built as hazards on the course, the need for safety and easy circulation on the course, the slopes of the greens and the availability of hole locations. On this last subject, Mandell is especially thorough; he has the crew mark exact elevations on a 10 foot grid, and he walks it slowly, calculating the slopes as goes, looking for places where they have gotten too steep or too flat, marking them for correction. After each hole, Mandell goes back his golf cart and enters field notes on his laptop computer. Hes not going to let any detail slip through the cracks, not at this point in the project, this point in his career. He’s followed a different path from most architects, and he has stuck to it even when it wasn’t always clear that he was headed in the right direction. As it turns out, the experience of working within constraints and developing an economical, minimalist approach to golf design has prepared Mandell for the lean times that now beset the design business. Many architects who lived high on the hog are doing what Mandell used to, chasing any work they can, while Mandell he keeps getting approached by prospective clients. It’s taken twenty years, but Richard Mandell now has a reputation as an architect who goes all-in on every job. He respects his clients and he gives good value. In a profession that has many stars and is often perceived as glamorous, Mandell spent a lot of time as an extra, just a face in the crowd, well out of the limelight. He did the humble jobs without complaining, and it seems that he has finally made it to the dance. He intends to enjoy it for as long as he can. You can read about the renovations at ANCC in the forthcoming issue of Virginia Golfer. Click here to visit Richard Mandell’s website.